When Bayley and Sasha Banks won the inaugural Women’s Tag Team Championship inside of the Elimination Chamber, they pledged to defend the titles against all comers, and boy howdy do they have all comers! After a few weeks of challenges, matches, and beatdowns, three teams have stepped up to make their claim, so let’s take a look at each of our participants in turn, their strengths and weaknesses and so on! Why they should win: As the reigning and defending champions, they’ve already prevailed over five other teams in the Elimination Chamber and beaten Nia Jax and Tamina at Fastlane. Plus, after years of being a shaky unit at best, they’re finally on the same page and firing on all cylinders with their teamwork— not exactly the Rock & Roll Express out here, but they’re killing it all the same. Why they’re not going to win: Well, the odds are stacked against them, for one. This is a one fall match and they don’t, as WWE is so fond of reminding us, have to be pinned or submitted to lose their titles. Plus, as much as they’ve been on the same page lately, there’s always something about Sasha that makes you wonder when she’s going to get sick of teaming with the Hugger and snap. Why they should win: Beth Phoenix coming out of retirement is a big honkin’ deal and Natalya has been a good, dependable hand in the women’s division for years such that a gold watch tag title reign would certainly not be out of order. Why they’re not going to win: Phoenix has been retired for over six years and while she’s looked great since coming back, she’s had all of one actual match and still has to be dealing with some ring rust. Plus, as good as the Divas of Doom were the first time, the women’s division was still in full-on Divas mode, three-minute matches and all, so they arguably have the least functional experience as a team of any of the women competing in this match. 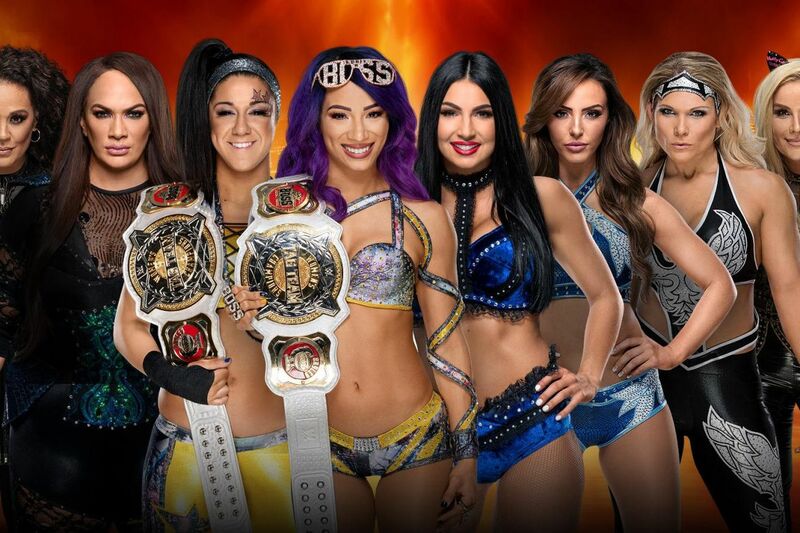 Why they should win: They are, of all these teams, the one that’s been a unit the longest and has the most experience as a tag team, even if they have the least gold to show for it. Plus they own a pinfall victory over the champions, and if they can do it once, no matter the circumstances, they can do it again. Why they’re not going to win: I mean… not to put too fine a point on it, but they’ve basically been a joke their entire time on the main roster. A funny joke a lot of the time, but a joke nonetheless, and that impacts their chances here. Why they should win: I mean, have you looked at them? They’re intimidating badasses of the kind that the main roster women’s divisions don’t have much of at all right now. Why they’re not going to win: Well, they’ve already lost in two previous chances to win the titles, and the third time isn’t the charm as often in pro wrestling as it is in proverbs. Plus they are by far the least interesting, least compelling team in this match as far as actual in-ring wrestling goes, and that matters. So, Cagesiders, who’ve you got to take the tag titles home?